Open Layout Makeover – Budget Friendly and Beautiful! You are here: Home / My Projects / Living Room, Dining Room and More / Open Layout Makeover – Budget Friendly and Beautiful! 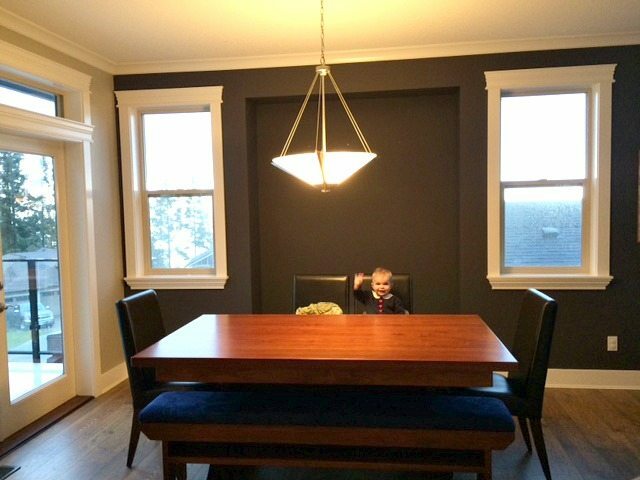 My client Jen had a beautiful home with great bones and furnishings we could work with – all it was missing was the right paint colour and a personality that better suited her young family. They loved the open layout main floor of their home, but felt it didn’t really speak to their personal tastes. With a love of blue and gray, they wanted a space that was bright, rustic, inviting and simple. In a decorating world where mantels are crammed and bookshelves are overflowing, it was fun to work with a client who just wanted a ‘simple, classic and clutter-free look’. While the entire space got a fresh coat of paint, artwork and lighting, we kept all of the main furniture pieces, drapes, flooring and fireplace stone. This made it easy to keep things within the budget and really, what she had was good, it was the details that needed a lil’ love! 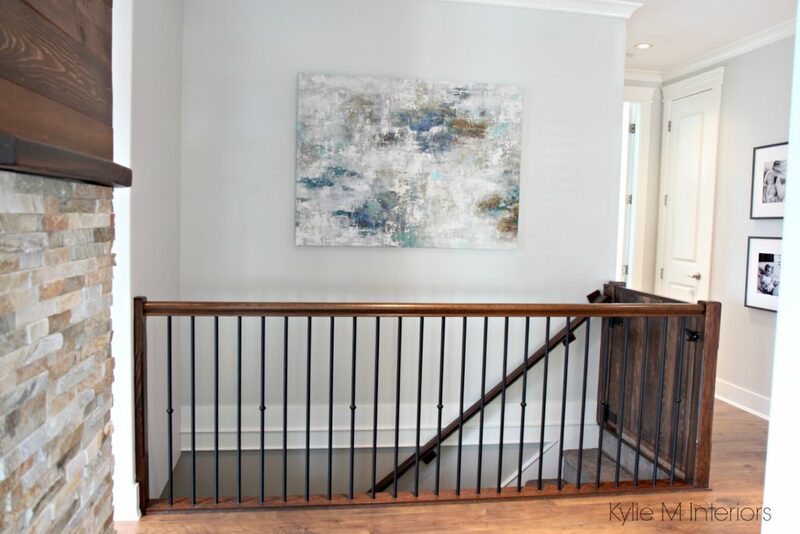 Benjamin Moore Gray Owl was the PERFECT paint colour for this home. Fresh and clean looking, yet not washed out, Gray Owl worked well as it transitioned from living room and dining room to kitchen and hallway. The space had a mix of exposures including North and East, which made Gray Owl lean slightly more toward the blue side of things, rather than the gray/green end of its undertones. Before. They had the foundation in place – couch, drapes, flooring and fireplace – it just needed to be pulled together. After. Pulling this room together was made even EASIER with the beautiful photography Jen owned. The photographer, Adrienne Madill of Vital Imagery ALSO happens to be her sis-in-law, giving even more meaning to this simple, family-friendly space. Before. I had a massive stare down with the fireplace. I couldn’t figure out what felt wrong, but I knew something wasn’t quite right and the solution had to be budget friendly and complementary to the stonework – which wasn’t going anywhere. I decided that we needed to balance off the look of the top and the bottom. With the small scale ledgestone and high contrast wood trim, the balance was off and the result was a cluttered mish-mash of products – all high-lighting the TV (which is not a good thing btw). And after. All it took was some wood and stain to pull this bad boy together. Oooookay, maybe it wasn’t that easy – there were a few install issues, but in the end it turned out beautifully on a budget! Before. This chandelier looked like it needed a full dining room suite from 2002 underneath it – not a living room. After. The drywall beam was clad in wood and a new chandelier was installed, creating a stunning focal point. 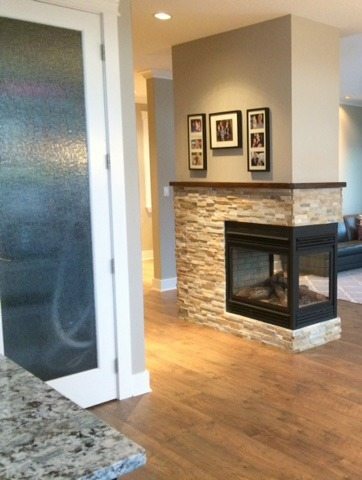 It’s a visual link not just to the fireplace wall, but to the alcove in the entryway as well. While they loved their feature wall, it was just a bit too overwhelming and they were tired of it. So instead of using a statement colour, we used a statement piece on a background of Benjamin Moore Gray Owl. The 3 sided fireplace faced the living room, dining room and the hallway, so it was important the we pulled the look all the way around. And with a nod toward their love of everything blue, we painted the pantry door Benjamin Moore Wedgewood Gray, a soft blueish gray. Before. The back of the fireplace was underwhelming and uninspiring. After. The flow is more seamless from space to space, using the fireplace as the Focal Point for all sides. Before. Nice wall – said no one ever. After. Fresh and fun! The hallway is no longer just the transition area to the bedrooms. It now plays an important decorative role in their home! Before. The entryway felt dark and disconnected from the rest of the home, even though it was in full sight-line from the rest of the home. After. By installing the same wood feature as the fireplace, we established a visual connection between the spaces and added some interest and texture. Jen sourced out an awesome mirror that finished it off perfectly! So there it is! Jen had great style and ideas, all she needed as a bit of moral support and brainstorming to create the home of her dreams! Does your room need a facelift? Check out my affordable E-decor and Online Colour Consulting Packages! What was the color of all the trim work? So beautiful! Unbelievable how the changes made everything seem fresh and updated! Well done. Just beautiful! The fireplace transformation is truly remarkable–you turned something that was awkward and not very attractive into something really beautiful and “pin-worthy”! I love how you added just the right touches of wood throughout the home to tie it all together! Great job! Thank you Phyllis, and yes, sometimes it’s just those lil’ touches that bring it all together! Just Beautiful Kylie! thanks for sharing! I love the makeover….like really love! This might sound silly but is the wood on the fire place and in the entryway actual wood planks or the peel stick faux looking planks? Hi Kelly, not a silly question at all as there are TONS of products out there like that! And no, it’s the real thing! love the hall pictures. what size are the frames and photos? Hi Amy! 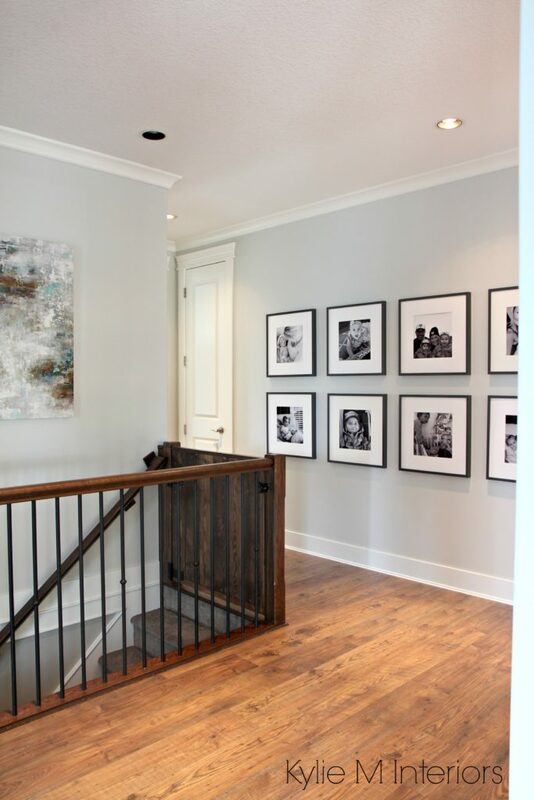 Those are Ikea frames – the Ribba collection (20×20) – they are fantastic AND affordable! What color did you use on the ceilings? Did you get the chandelier from Home Depot? I love what you’ve done here. Hi Kari, thanks for asking – that’s actually a Wayfair purchase! I love what you have done, and the clock for the statement wall is fabulous, would you mind telling us where it came from.